Fidget Spinner by Ketchapp is the hottest new Android mobile game which you can now also play on Windows PC and Mac as shown in this guide. Fidget Spinner for Android is available on iOS app store by the name of Finger Spinner. Mobile users can download this addictive game from their respective app store. However, there is no such game available on Windows PC or Mac app store but that doesn’t mean you cannot play it on desktop PC or laptop. Keep on reading to learn how to download and install Fidget Spinner for PC, laptop and desktop using mouse or keyboard via Android emulator tool and play this relaxing spinner app for free. 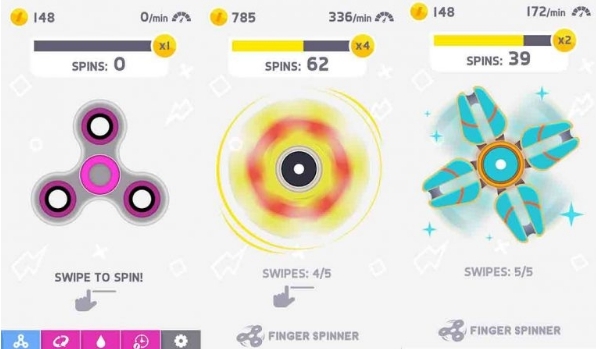 In Fidget Spinner, your main goal is to spin a spinner that it keeps spinning for a long, long time without stopping. As you break the longer spinning record time, you will get better spinners and rewards. You can choose spinner in your favorite color and shape. Best spinners are locked, you have to first score enough points to unlock them and to progress to the next stage. All you have to do is to swipe right on the screen to spin the spinner. In each round, you get five spins, it’s about how well you use those five spins to set longest spinning time record. Available spins are shown on a counter above the spins. And on the top right and left corner, time and coins count are shown. For each spin, you get a coin, and once you manage to spin fifty times, you get 2X coin upgrade to multiply your wining for the round. For hundred spins, you get 4X coins. Spin upgrades can be purchased to get better spinners with speedier spins. You can get the first upgrade for 10 coins to enhance speed to up to 2X. Second upgrade requires 80 coins for 4X speed and so on. You can use coins to grease the wheels of spinners in order to reduce speed for increased spinning time. First grease costs 20 coins, next is for 160 coins and so on. Restless earner upgrade gives you 1 coins a minute when offline, which you can get for 30 coins and 240 coins each. Now you can download Android mobile game from the play store. However, fans of PC gaming can download, install and play Fidget Spinner for PC on any desktop PC/laptop on Windows 10, Windows 8, Windows 8.1, Windows 7, XP and Mac OS using a third-party emulator too. 1 – Download BlueStacks App player for PC latest version. For playing Android on PC without internet download BlueStacks Offline Installer. And to play rooted Android apps on PC download rooted BlueStacks. 3 – Download Fidget Spinner APK and save it on PC Windows or MAC. 4 – Click on the downloaded APK file to directly install the app on BlueStacks. Make sure to choose BlueStacks As Default program to run the APK file. 5 – Or search Fidget Spinner on BlueStacks and install it from Play Store for BlueStacks. 7 – Back on the main menu of BlueStacks, click the ‘All Apps’ icon (Android tab on BlueStacks 2 and then ‘All Apps’), click on the newly installed app and follow on-screen instructions to setup the app on PC. You can also play iOS version of Finger Spinner on PC using best iOS emulators for PC.